As part of ongoing acoustic research at Binghamton University, State University at New York Distinguished Professor Ron Miles has created a workable sensor with the least possible resistance to motion. The thin and flexible sensor is ideal for sensing sounds because it can move with the airflow made by even the softest noises and addresses issues with accelerometers, microphones and many other similar sensors. "The goal was to create a sensor that only resists gravity," said Miles. "The sensor needed to stay connected to the device but other than that, I wanted it to move with even the slightest sounds or movement of the air." Being able to move with the air is how sensors are able to tell when a sound is present and which direction it is coming from. Miles made headway with acoustic sensors in 2017 by using spider silk dipped in gold as a thin, flexible sensor to make a microphone with remarkably flat frequency response. This sensor incorporated a magnet in order to convert the silk motion into an electronic signal. As an alternative to using a magnet, Miles set out to create a capacitive sensor. Instead of needing a magnet, a capacitive sensor requires a voltage added to it via electrodes. 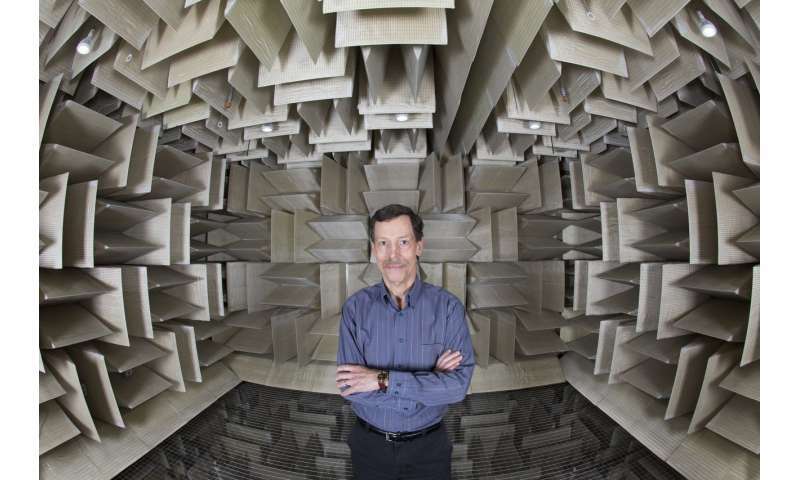 Two billion capacitive microphones are produced every year but making them both small and effective comes with some challenges. His new platform provides a way to detect the motion of extremely thin fibers or films by sensing changes in an electric field without the use of a magnet. It hasn't previously been feasible to use capacitive sensing on extremely flexible, thin materials because they've needed to resist electrostatic forces that can either damage them or impede their movement. "Researchers want the sensor to move with small forces from sound, without being affected by the electrostatic forces," Miles said. In this most recent work, Miles has found a design that allows the thin, flexible sensor—which could be spider silk or any other material just as thin—to swing above two fixed electrodes. "Because the sensor is at a 90-degree angle from the electrodes, the electrostatic forces don't affect its movement," said Miles. This is a critical part of the design because the sensors need to have a high bias voltage—the voltage required for a device to operate—to be effective since the sensitivity of the sensor increases with a high bias voltage. This design means that capacitive sensors, like the ones used in smartphones, can be both smaller and more efficient. Miles said the unique design also provides a few other benefits important in various applications. "The way the sensor is designed now means that it has a nearly constant potential energy but can also return to its equilibrium after large motions."